Many times, when students of all ages come to Mathnasium in need of math help, their math troubles can be traced back to a lack of number sense—an intuitive grasp of how numbers work! What’s the first step to gaining number sense? 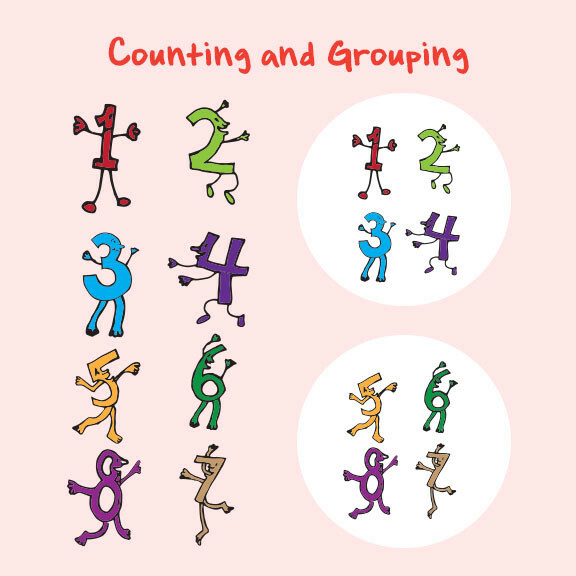 Well, the most basic skills in mathematics involve counting and grouping (seeing numbers in groups). When mathing with your kids, try the exercises outlined below. While they may seem easy at first glance, these exercises are anything but child’s play. They’re appropriate for any person of any age who needs help gaining fluency in basic math skills. The trick is to do these exercises mentally—with little to no writing. However, using pictures as visual aids and real-world objects (counters, coins, blocks, raisins, etc.) as manipulatives can make math come alive! To develop counting skills, help your child learn to count from any number, to any number, by any number! Count by 3s, 4s, 6s, 7s, 8s, 9s, 11s, 12s, 20s, 25s, 50s, 75s, 100s, and 150s, starting at 0. Can you see how this type of counting practice will, in time, result in strong addition skills and the painless mastery of times tables? Notice how these questions focus on the number 10, multiples of 10, and powers of 10. Also, these questions are a great way to introduce multiplication and division concepts before your child encounters them in school! Which techniques do you use when you math with your child at home?